Following the abrupt resignation of James Schrimpsher from the Eatonville Town Council, council member position No. 5 is now vacant. The sudden departure was announced at the Monday, March 11 meeting, in a letter from Schrimpsher. Schrimpsher stated in his letter that an “increase in workload and obligations to (his) full time job and involvement in (his) professional organization” as the reasons for his departure. His term was set to expire at the end of 2019 and his letter expressed that he had not been intending to seek another term. A new candidate for the now-open position will be sought out. During the meeting, South Pierce Fire and Rescue Fire Commissioner Kevin Kneeshaw expressed his displeasure at remarks made in the previous town hall meeting regarding upcoming renegotiation of the contract between South Pierce and the town of Eatonville for fire services. “I believe the remarks were wholly inappropriate,” Kneeshaw said. Dunn’s original comments were in regard to a proposal by the firefighters union to discontinue the use of volunteer firefighters working alongside paid professionals. Kneeshaw explained to the council there is approximately $75,000 shortfall in revenue versus the cost of providing service. The contract will be renegotiated later this year. Eatonville resident Judy Scalf appeared before the council a second time to express her continuing displeasure at the results of the council vote on whether or not to allow retail marijuana shops within town limits. The council voted in January to allow such shops, despite a slim majority of town voters having voted not to do so in a citizens’ advisory vote last November. Councilmember Jennie Hannah responded with a defense of her actions. “The advisory vote told me everything I needed to know as a councilperson,” she said. 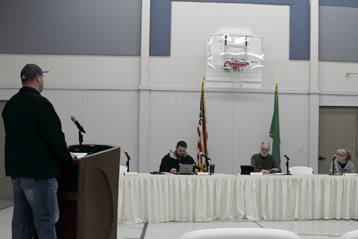 Had a permanent ban gone into effect, Eatonville would have been excluded from receiving certain state funding – funding which is not contingent upon the physical presence of a retail marijuana shop, but merely on the possibility of one being allowed. “(This way) the town gets revenue, even without a shop,” Hannah said. District Manager for Pierce County Refuse Chris Giraldes gave an update on proposed rate increases that would be implemented through upcoming contract amendments. Pierce County Refuse, which manages garbage collection in the town of Eatonville. The higher costs are a result of recent changes in the global recycling market, particularly the implementation of China’s National Sword policy. The policy drastically reduces the amount of contamination allowed in recyclable products from 5 percent down to 0.5 percent. He went on to explain how China, followed by Vietnam and Indonesia, are no longer accepting mixed paper and plastic. As a result, additional sorting must be performed before shipping the material overseas and the extra labor and effort means extra costs and thus, reduced margins. Giraldes explained his company is incurring a loss of roughly $100 per ton compared to two years prior. He said rates would need to rise by a minimum of $1.98 per customer per month just to break even. “We’re hoping the market will turn around and get better,” he said. If it does, savings could potentially be passed along back to the customers. “To be good partners and have a good program that’s sustainable, I’m asking for your support,” he said. Resolution 2019-I, regarding a membership agreement for Eatonville to join the Association of Washington Cities GIS Consortium Program, was presented to the council by Town Administrator Abby Gribi. She explained how Eatonville does “not have accurate maps right now,” which makes it difficult to plan maintenance, repairs and upgrades to the town’s utilities. By joining the consortium at a Tier 4 level, it would buy 220 hours of professional support services at a cost of $22,000. The services would include reviewing old plat maps as well as physically locating water valves and other infrastructure in order to develop accurate Geographic Information Service (GIS) maps for the town. “This will be actual hours of their dedicated staff putting into our GIS system,” Gribi said. She said the level of effort was expected to be enough to complete 80 percent of electrical, water and wastewater systems mapping by the end of the year, after which the town’s membership in the consortium could be scaled back. “We want to front load the project so we can get accurate maps quickly,” she said. She went on to explain how much of the present knowledge of the system resides only in the heads of current town utility employees. With a number of retirements expected in the next five years, that “institutional knowledge” will be lost if not permanently captured. The resolution will be up for a final vote at the next town council meeting, which is scheduled for Monday, March 25.